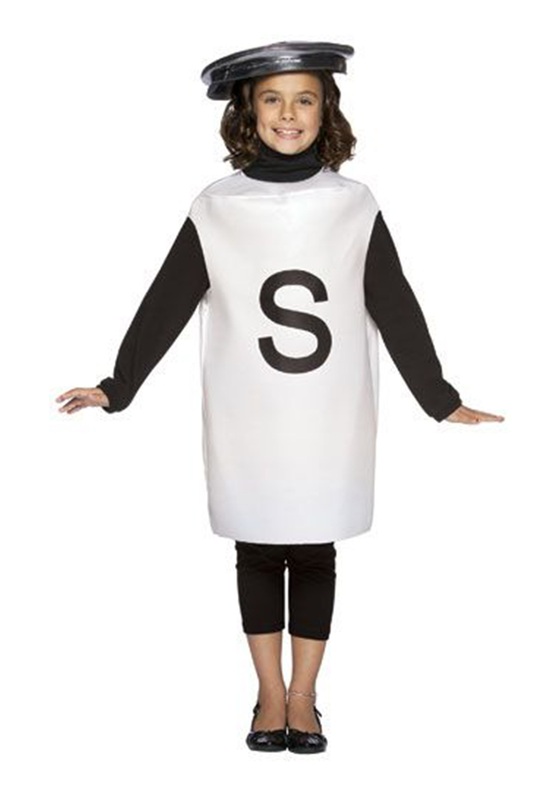 White sleeveless tunic with large "S"
Perfect to go with a friend as "Pepper"
Your kiddo may not normally be a salty individual but this Halloween she can be the saltiest person in town. Grab this Child Salt Costume and transform your little one into one of the five basic taste sensations. Salt is essential to the health of us humans, so you can be sure that everyone will love your salty sweetheart! Salt has been around for ages. It used to be valued so highly that even Roman soldiers were paid with rations of salt. This seemingly simple ingredient has over 14,000 uses... no wonder it has such great value. Besides preservation, healing, fertilizing, cleaning, and making cheese there is one more amazing thing your little girl will be praised for when she runs around in this costume. We know it's pretty hard to beat helping to make cheese, but trust us that's not the coolest thing that salt can do. As superstitions go, salt is also supposed to be a massive aid in fighting off the forces of evil! Restless spirits, demons, and even the Devil are said to be warded off with the use of salt. Pretty cool, right? Just when you thought your little girl would be a cute table condiment, she's suddenly a weapon against the supernatural! No one will have to worry about witchcraft or random curses brought on by the evil eye, not when your little shaker is around. Make your kiddo into a symbol of prosperity, fertility, and great protection when you grab her this adorable Salt Shaker Costume.